Tourist information for Eastern Ireland from Drive-Alive. Touring in Louth Meath Longford Westmeath Offaly Laois Kildare by car. Tourist information for Ireland East. Drive-Alive Holidays in Ireland East. Great prices on self-drive holidays to Ireland; book your ferry and accommodation. This lesser known region of Ireland might not have the majestic scenery and wild spaces found elsewhere in the Emerald Isle, but it does have beautiful verdant countryside, lush valleys and wooded hills. This is the country for the walker, cyclist, horse-rider and angler, as well as possessing numerous quality golf courses and an abundance of historical sites. In the north is Dundalk, county town of Louth, and a useful base for exploring Northern Ireland. County Wicklow, just an hour's drive south of Dublin, is blessed with a delightful coastline, the lovely Wicklow Hills, and the almost fairy-tale scenery of the Vale of Avoca. Base yourself in the busy port of Arklow with its white sandy beach. Stay in Aughrim in the heart of the Wicklow Hills, or in the Macreddin Holiday Village in the Vale of Avoca. Moving eastwards into the south of County Kildare, Kilkea Castle Hotel in Castledermot really is a castle. Built in 1180, it is the oldest inhabited castle in Ireland, boasting a 6,100 metre Golf course. The countryside around is largely agricultural and there is good and easy walking along the river banks. Laois is home to the beautiful Georgian village of Durrow. Angling, hill walking, equestrian facilities, historic sites, nine golf courses, an agriculture museum, a traction engine museum, clear rivers and streams, gentle hills and woodland walks are all located within 30 minutes of this excellent base. The small village of Clogh, or Clough is another excellent base for touring this quiet corner of Ireland. Portlaoise is the county town and administrative centre. The beautiful Slieve Bloom Mountains are easily reached from all these locations. County Offaly is rich in history, and dominated by enormous peat bogs. Fishing, walking and water sports are popular on the Shannon and Grand Canal, and the Slieve Bloom Mountains provide excellent walking. Birr is a lovely little town with a lively nightlife and good restaurants, as well as a superb castle. Banagher on the Shannon is another town worth visiting, especially if angling and boating are for you. 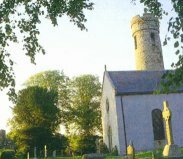 Clondra, or Cloondara, in County Longford is also a great spot for anglers, as is Athlone, the county town of Westmeath, situated where Lough Ree drains into the Shannon. 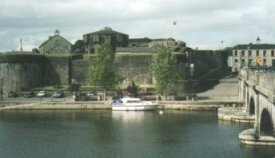 Athlone is now a modern town with good shops, some excellent restaurants, an impressive castle and cruises on Lough Ree and the Shannon.